Valpolicella is a DOC wine region and a wine. You’ve probably heard of Amarone, the most well-known wine of the area, but there is so much more to discover. Amarone isn't everyday drinking wine, even for the Italians, but it is a wine that can be appreciated especially after understanding the care and details that go into making the wine. In terms of the history of the region, fossil remains date back to the Iron Age proving that the European vine was cultivated here. Greek and Roman literature also make numerous mentions of winemaking activities in Valpolicella. There are three different territories within the region, one of which is called "Classico." This historical zone includes the three valleys from west to east; Fumane (calcareous rock), Marano (basaltic volcanic rocks, known as Toari) and Negrar (muddy clay). The rolling hills are terraced with vineyards and grapes are grown using the Pergola method. This technique is where the vines are grown vertically up wooden poles, and then horizontally, creating a leafy canopy. This canopy gives the grape bunches more room for growth and provides needed shade against the hot summer sun. The area produces four wine styles: Valpolicella, Amarone, Ripasso and Recioto. And all made with the same indigenous grapes: Corvina, Corvinone, and Rondinella. A Valpolicella wine is considered a young wine and meant to be an everyday drinker. To me, it closely resembles French Beaujolais, and in the summer it can be served chilled. The two main grapes give the wine its flavor profile. Corvina; is all bright cherry, strawberry, and hard candies. Corvinone; brings the spice (black pepper). So depending on your flavor profile, look for the appropriate percentage of these two grapes. The others all have some form of appassimento (air-drying), where the fruit loses significant water mass, resulting in distinctive power and concentration. Recioto is called the “grandfather” of wines because it is the most ancient. 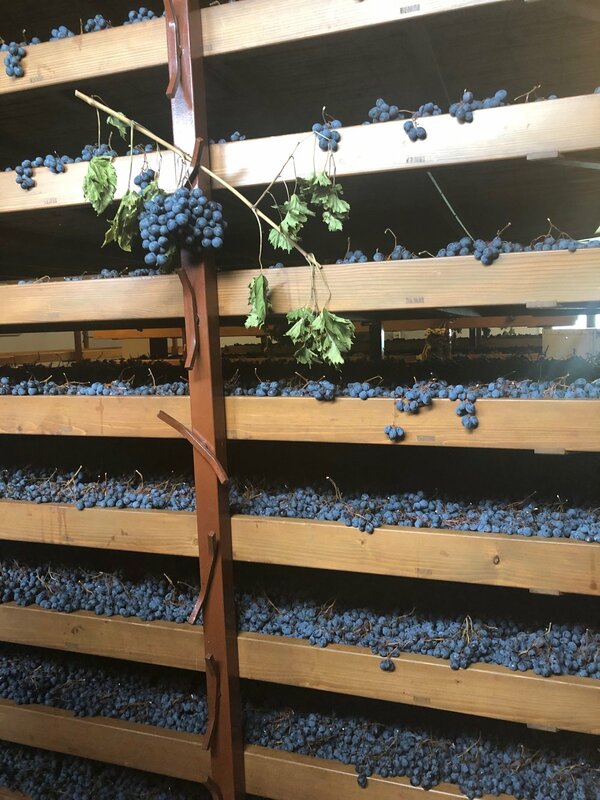 Grapes are dried for two months and then stopped to retain sugar and achieve sweetness in the wine. 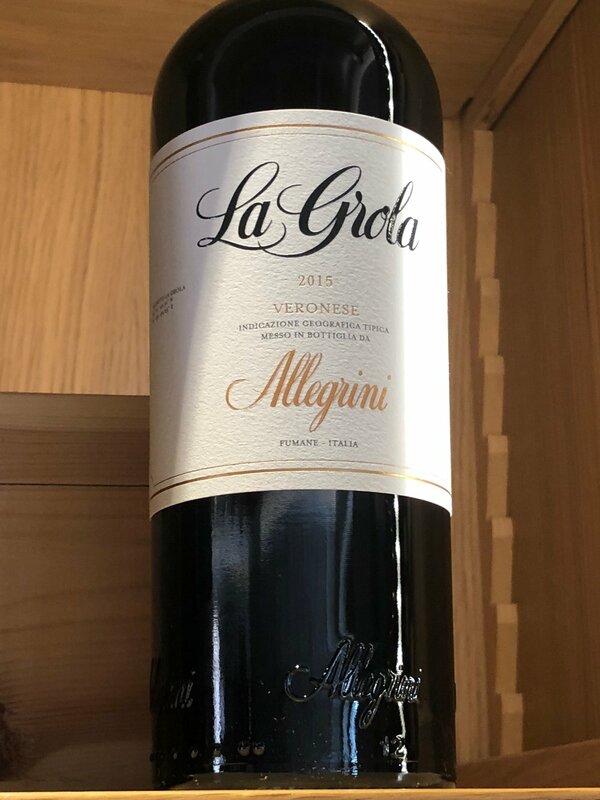 A favorite of many local Italians because it's the first wine they drink growing up. 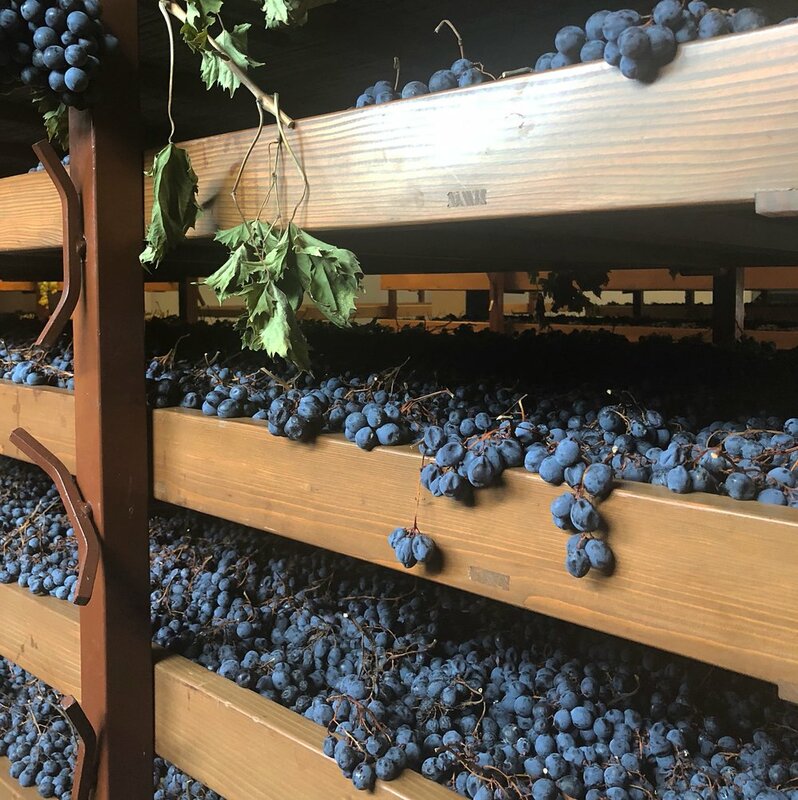 Amarone is referred to as the “mistake” as the grapes were mistakenly left to dry for four to six months which in turn the yeast consumed the sugar and made a dry, highly complex wine. This process makes them distinctive with flavors of raisin, a rich mouthfeel, and full-bodied structure. To me, this is a perfect wine to curl up with in front of a roaring fire on a cold night. The last but not least is Ripasso, a technique where Valpolicella wine is combined with the extra dried grape skins from Amarone. This adds more tannin and complexity to a Valpolicella. I really enjoyed many I tried, an excellent middle ground between a bright Valpolicella and bold brooding Amarone. 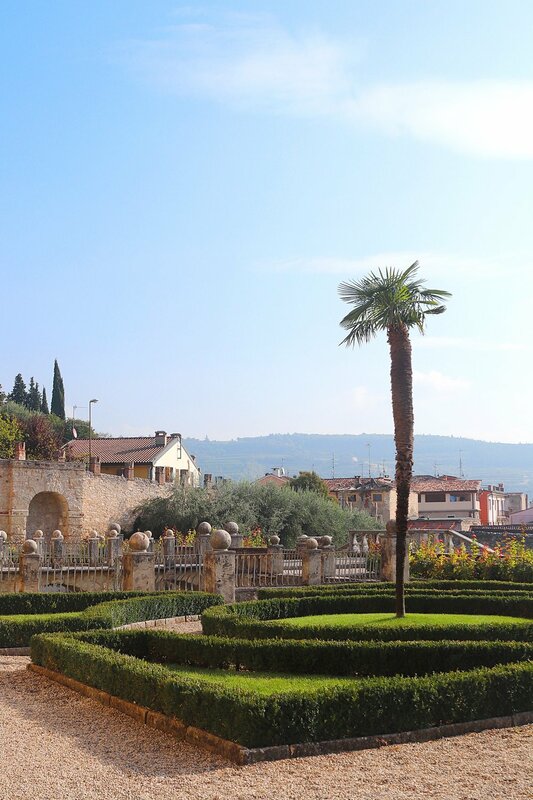 The historical wealth of the Valpolicella area lies in its ancient villas, one of which was fabulously restored by the Allegrini family. 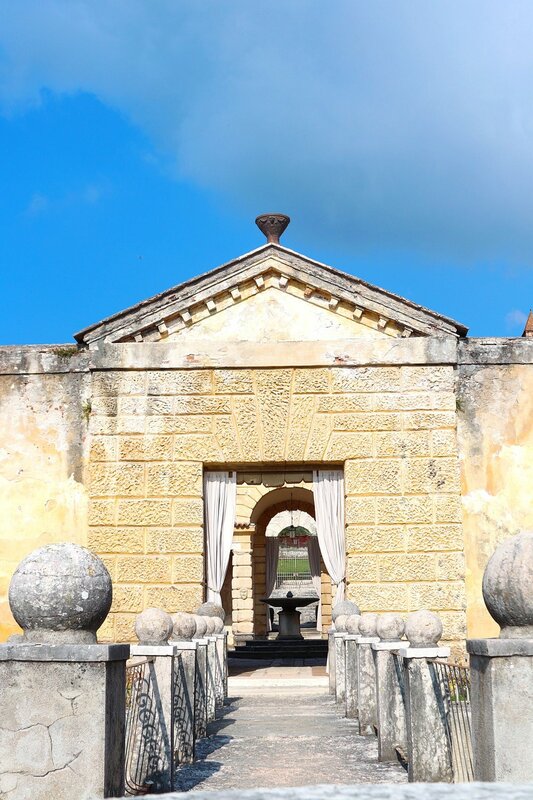 Villa della Torre was built in the 16th century, a property that embodies the Italian Renaissance from the architecture, gardens and a private chapel. A standout detail for me was artist Giovanni Battista Scultori walk-in fireplaces depicting angels, devils and sea monsters. Tasting wines here you can almost imagine yourself as part of a noble family. 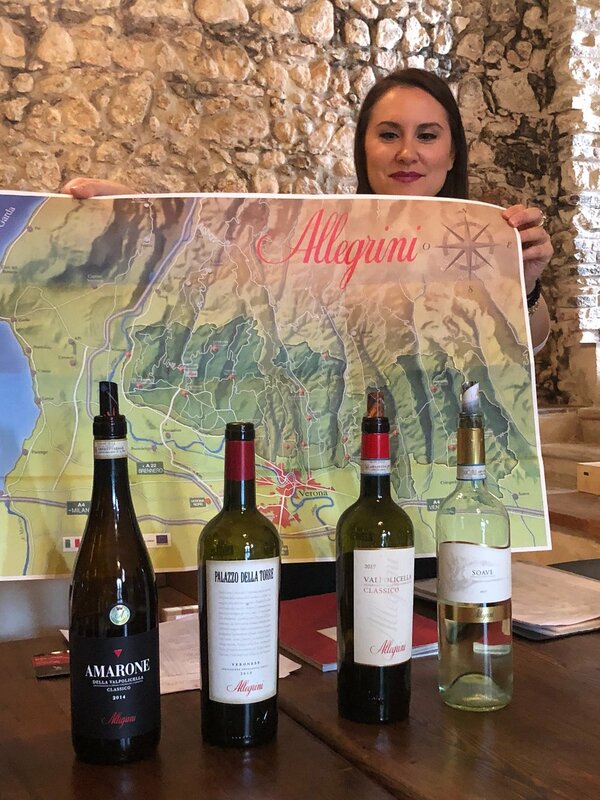 Tenute Ugolini is a beautiful estate re-purposing a 12th-century monastery to house their tasting room and production facility. The vineyards have been part of the Ugolini family for generations, but they only became wine producers in 2010. With 22 hectares classified biodynamic each wine is produced in single vineyard bottling’s. Click For details on our suitcase wine. La Dama is a small winery run by a young couple, Gabriele and Miriam. They have 10 hectares located in two different municipalities of the Classic Valpolicella and farm biodynamically. They are happy to have visitors and share their passion through stories and their wines. Click for details on our suitcase wine. Roberto Mazzi Winery is a historic winery in Negrar, located within 300 meters of Quintarelli winery. 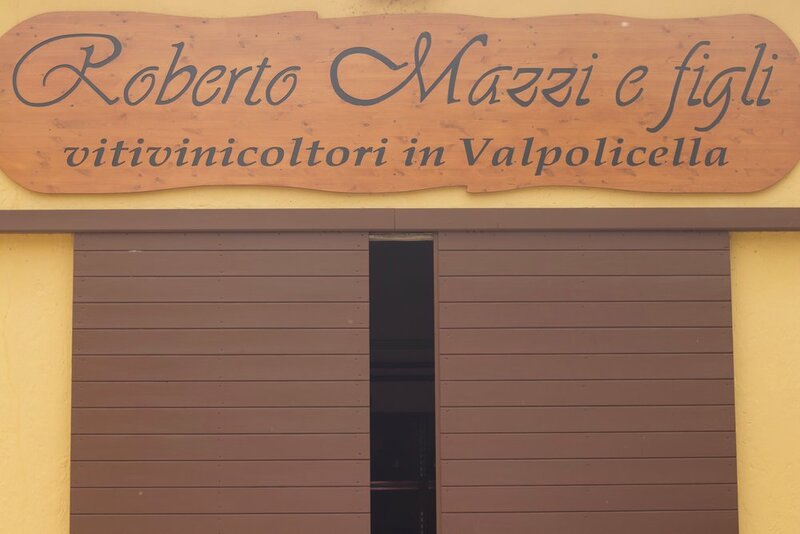 The Mazzi’s strive for pure fruit, elegance, and restraint in their wines rather than a massive style. Two brothers run the winery, Antonio and Stefano, and are jacks-of-all-trades. While one was showing us around the vineyards and the production, the other was overseeing the creation of our lunch. 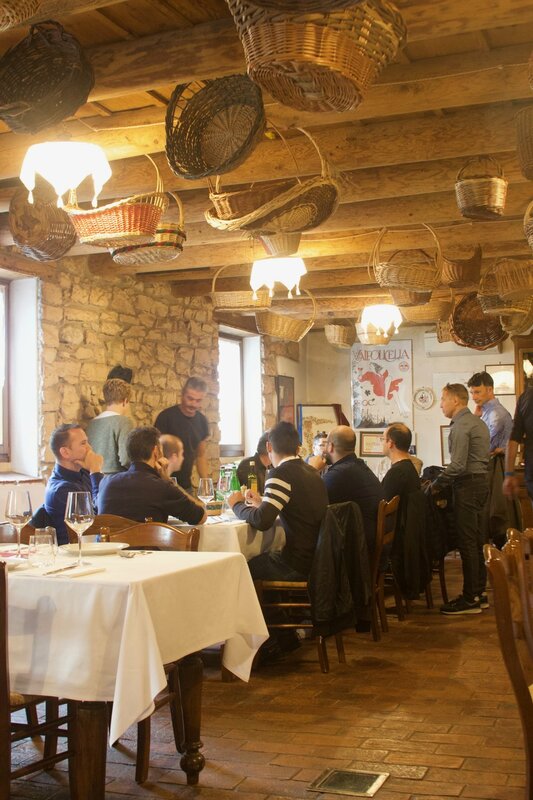 Such an excellent way to experience their wines, perfectly paired with traditional dishes from the region. Truth be told, some horse was consumed. However, the highlight was the perfect ending with their Recioto, which has an extraordinary bouquet and great depth. A sumptuous nose of cherry jam, dried violets, stewed plums, rhubarb all beautifully framed by sweet spices and the taste is sweet like a dream. Further east outside of the Classico area at Cellore d’Illasi, is the winery of Romano Dal Forno. He was an apprentice to Giuseppe Quintarelli, learning how to produce quality wines. He moved beyond the traditional ways, developing his own techniques and affirming him as one of the best Amarone producers.